Download selected key UN reports on a variety of peacekeeping-related issues, produced by the Secretary-General, or by his specially-designated panels for the consideration of the General Assembly and/or the Security Council. You can find reports related to individual operations on the mission factsheets. 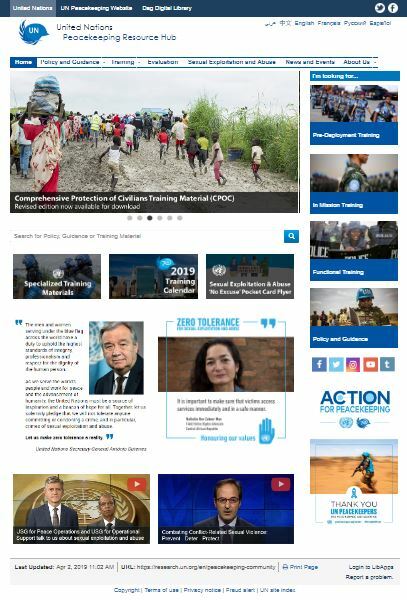 Building on the first version of the Action Plan released in January 2018, this version incorporates inputs following a workshop held in March with representatives from our missions in the Central African Republic, Mali, Democratic Republic of the Congo, Darfur and South Sudan. The revised Action Plan provides additional detail in several areas, including efforts to establish accountability for attacks against peacekeepers, peacekeeping intelligence and gender dimensions of improving security of peacekeepers. The Action Plan remains a rolling document which is open to input from all constituencies with a stake in the security of peacekeepers. The Action Plan details how the Secretariat and peacekeeping missions (MONUSCO, MINUSCA, MINUSMA, UNMISS and UNAMID) intend to respond to the recommendations of Lt. Gen. Santos Cruz and outlines the actions they will take to improve the security of our peacekeepers. long-term actions to reduce fatalities. The report’s focus is to change the way the United Nations does business in high-security risk peacekeeping operations. Implementation of the recommendations of the High-level Independent Panel on Peace Operations. The Independent High-level Panel on Peace Operations was convened by former Secretary-General Ban Ki-moon to undertake a thorough review of the current United Nations peace operations and the emerging needs of the future. Moving towards partnership peacekeeping, providing assessment and recommendations on the progress of the partnerships between the United Nations and relevant regional organizations in peacekeeping operations focusing primarily on the partnerships with the African Union and the European Union. Recommendations of an independent expert panel on how technology and innovation can be leveraged to increase the effectiveness and efficiency of peacekeeping. The global field support strategy, launched in 2010, provided a five-year strategic agenda to reshape and strengthen support to United Nations field missions. Strengthening the capacity of the United Nations to manage and sustain peacekeeping operations through the restructuring of DPKO and the establishment of DFS.